EVS presents IPEdit.3D, the first 3D live editing solution featuring a complete timeline editing performance without rendering. IPEdit.3D will be unveiled and exhibited at the NAB Show in Las Vegas (April 10th-14th) at the EVS booth C9508 (Central Hall). Introduced in 2009, IPEdit is IPDirector’s timeline editing module, which is EVS’ content production management suite. IPEdit is the first tool giving operators, working on fast-turnaround productions, the same workflow as the non-linear edit controller while opening up all possibilities of a tapeless world. The solution has been adopted by worldwide broadcasters for daily events and productions requiring ultimate speed and efficient editing. 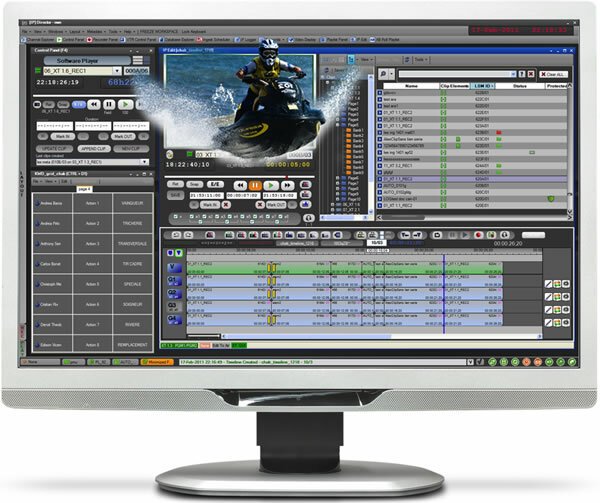 The new timeline editor offers a direct control over recording and playout channels using EVS’ XT & XS series servers. It ensures immediate access to multiple live feeds (such as multiple ISO cameras) for quick-fixing or on-the-fly highlight package operations. With the introduction of the new generation of EVS XT servers, XT3 features new DualPower technology. Broadcasters now have the possibility to manage up to six IN/OUT 3D channels on one single server. IPEdit.3D offers immediate control over multiple 3D channels recorded and played back by the new servers. It offers all the advantages of 2D live editing operations in 3D mode, giving broadcasters full flexibility to switch from 2D to 3D, either in dual link or in 3G SDI input/output configuration. IPEdit.3D is the perfect solution for ‘on-the-fly’ 3D highlights and closer creation, as well as for quick program assembly with intuitive timeline editing functions like drag-and-drop and keyboard shortcuts for easy 3D video and audio transition effects. Its unique architecture, which never requires edit rendering, allows a 3D edit while simultaneously working on it in the timeline. This ‘edit-while-playout’ mode gives extensive flexibility to 3D broadcasters working in a fast turnaround production environment. IPEdit.3D can also be used to handle rough cut editing with simple mark IN/mark OUT, on multiple live 3D feeds to facilitate further post-production processes using third-party editing tools.